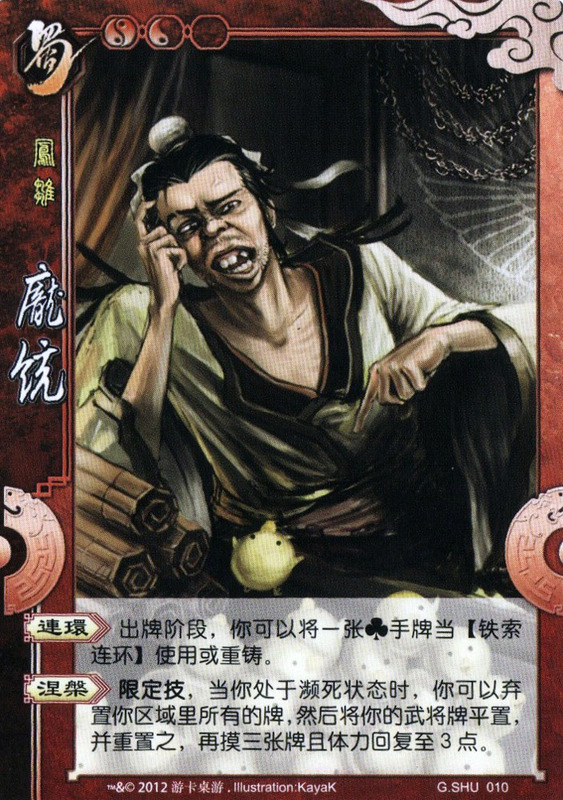 "Rising Phoenix 凤雏 (fèng chú)"
The second smartest person of the era, but also probably the ugliest in looks. Pang Tong is supposedly Zhuge Liang 诸葛亮's equal in the brains department. Where Zhuge Liang is given the nickname "Hidden Dragon 卧龙 (wo long)", Pang Tong is given the nickname "Rising Phoenix 凤雏 (feng chu)". However his hideous looks made some doubt his ability, such as Sun Quan 孙权. Pang Tong is credited as the critical link behind Cao Cao 曹操's spectacular defeat at battle of Red Cliffs 赤壁之战, but he did not live very long to share his talents. Imagine how the world would have been different had Pang Tong lived a decade longer, where both he and Zhuge Liang were helping Liu Bei 刘备. Character ability 1: " Shackle 连环 (lián huán)"
During your action phase, you can use an on-hand card with the suit of clubs as IRON SHACKLES铁索连环, or to re-draw 1 card. When you are at the Brink of Death, you can discard all of your cards (on-hand and equipped) and all cards in your pending area, then reset your character card such that it is unstacked and unshackled, draw three cards, and regain your health to 3 units. "Shackle" has not been changed. You can still use any number of cards with suits of clubs as IRON SHACKLES. The ability description of “Resurrection” has been changed, that you can unstack your character cards when you are resurrected. "Shackles" is a perfect match for Pang Tong since he practically masterminded the shackling of Cao Cao's ships at the battle of Red Cliffs. The shackles turned out to be the key reason for the blaze which wiped out Cao Cao's troops. You can read more about this incident in my write-up on IRON SHACKLES.